A living room is like your personal art studio. It generally portrays your choices of interiors which also reflect on the kind of personality you have. No matter if you think that your own blue living room is not that typical posh looking studio; it must be one of its own beautiful kinds – aesthetic and warm. But if you wish to make it look really gorgeous and cosy, here are a few useful tips. 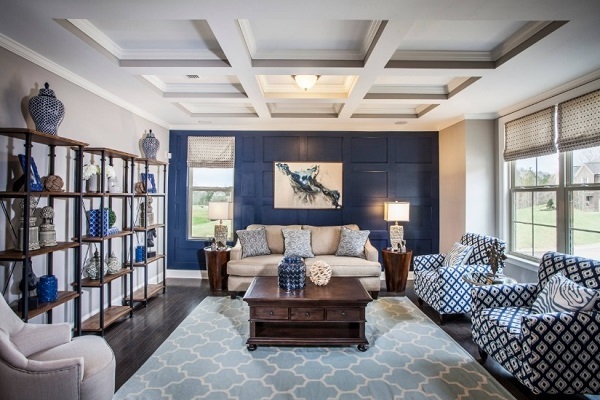 Apartment or homes, sofas must be good going with the type of blue color on the walls. If you think sofas are way too mainstream, there are always different choices of seats. You could replace the sofas with bamboo chairs placing in the center with an ordinary glass table containing a bowl with blue-white stones. Placing a grayish blue armchair sideways could be an option too. Blue could mean power, masculinity, warmth or sky and beach to a person varying on a different perspective. You could paint the walls blue or design with more experiments contrasting to your visions. But, it is very important to choose the right shade and the design matching to it. You could apply theme related to the beach or skyway wallpaper. There has to be a color accent which would brighten the color blue and take the spotlight. A nice dress might always make you pretty, but with accessories, you might look even prettier. In the same way, a living room including more accessories would make it look complete. You could include an aquarium or a bowl of fishes having Angelfishes or Jack Dempsey, a dining table sideways or in the centre. You could hang dream catcher and photo frames on the walls with the edits of blue. Blue or grey carpets beneath the chairs or the centre table would keep the theme on fire and your feet warm. You could also place items like a lamp, scented blue candles, and small chandlers above, pillows on the couches/chairs, dining sets matching the shade of the wall or just white. Blue might be a color which brings the warmth in, but including plants would bring the freshness indoor. Greens and blues altogether bring nature in, so why not bring alive the nature in your living room? You could keep a bowl or pots of flowers and plants like Money plant, Anthurium, Coffee plant, Cacti and what not. There is an endless number of plants that could be brought inside the room. Make sure the pots or the bowls matches your theme. Every interior should be inter-related with the applied blue theme. Lights are one of the most important things. The wrong lights could end up making a bright color dull, so make sure the lights you use are bright enough to lighten the room. Try avoiding contrast colors and use more white or blue lights. You could also use LED strip lights around the furniture sticking to the wall. Extra tip: Use dark to light shades of blue mixed with a little grey and your classic studio is ready and Instagram perfect!